Home > Blog > Aneurysms > It’s Time to Step Up to the Plate! 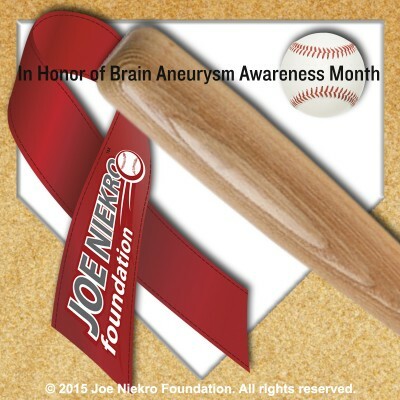 In support of Brain Aneurysm Awareness Month, The Joe Niekro Foundation™ (JNF) encourages you to “Step Up to the Plate…and Donate this September. Step Up to the Plate…and Donate is designed to increase awareness of brain aneurysms and AVMs (Arteriovenous Malformation) through the eyes of survivors, caregivers, friends and families who will be sharing their own stories in attempt to educate the public on the warning signs and risk factors of brain aneurysms and AVMs. To take the Step Up to the Plate challenge, participants will be directed to the JNF Step Up to the Plate donation page. Anyone interested in creating their own pledge page, or forming a team where they can share their story with others, provide education to the public and create hope for patients and families across the globe, may also do so. Funds will benefit brain aneurysm and AVM awareness programs through The Joe Niekro Foundation. There’s nothing quite as appealing as the sound of the words, “You’ve just won a prize!” So, to show support for all efforts, the JNF will be awarding Visa gift cards to the Top 3 earners. First place will receive $750, $350 will go to the 2nd place earner and $100 for 3rd place. *Note, no funds from this campaign will be used for the awarded prizes. The coin has been tossed, the players are ready and the game has begun so, Step Up to the Plate this month for brain aneurysm and AVM awareness. It is estimated that 6 million people in the US have a brain aneurysm (1 in 50 people). Every eighteen minutes an aneurysm ruptures; killing 50% of those victims within minutes. Of the remaining half, 50% will suffer a delayed death and those remaining will usually suffer severe brain deficits. “It’s important that we bring awareness to these silent killers and educate the public on the warning signs and risk factors associated with them. Far too many innocent lives are taken each year as a result of one of these conditions and we are here to help educate others before it’s too late. Survivors need a platform to share hope with others and we are so fortunate that we are the outlet for them to do so,” says JNF Founder Natalie Niekro.